The Gaia mission, scheduled to launch Thursday morning (Dec. 19), could be a bonanza for discovering exoplanets, perhaps finding more than 2,500 new alien worlds, scientists suggest. 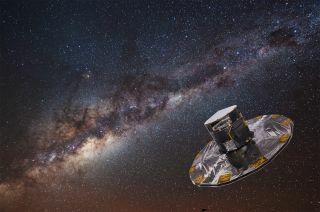 Gaia, a $1 billion (740 million euros) mission from the European Space Agency (ESA), aims to chart a 3D map of the Milky Way by surveying more than 1 billion stars, amounting to about 1 percent of the stars in the galaxy, using its billion-pixel camera. Its goal is to make the largest, most precise map of where Earth dwells by observing the position of each of these stars 70 times over five years. To pinpoint the position of a star in 3D — a field known as astrometry — Gaia will measure the distance of the star from the sun. The satellite will do so by watching how its position shifts over time. As the Earth orbits the sun, the apparent positions of stars change with regard to each other due to how our viewpoint has moved, a phenomenon known as parallax. Discovering a star's distance can narrow down many of its other details. For instance, the actual brightness of a star can only be determined by not only measuring how bright it appears but also how far away it lies and thus how distance might have dimmed its light. Once researchers know how bright a star actually is, they can determine how much fuel it must burn — that is, the star's mass. A star's brightness is also related to its width, and so discovering its brightness can help deduce its size. Knowing a star's mass and size then helps determine the strength of gravity on its surface. Gaia will also scan the color of stars. This can help reveal details of their chemical makeup as well as its temperature, as the color of a star depends on its surface temperature. Knowing the brightness and color of a star can also help figure out its age and thus stage in its evolution. All in all, Gaia will help shed light on the composition, formation and evolution of the stars that make up the galaxy, researchers say. Gaia is not the first space mission to chart the stars. In 1989, ESA launched the Hipparcos satellite, which charted the positions of more than 100,000 stars with high precision and more than 2 million stars with slightly less precision. In the end, Hipparcos measured the distances of all stars within 325 light-years and bright stars within 3,250 light-years (to within 10 percent). In comparison, Gaia will collect more than 30 times more light than Hipparcos. This will help measure a star's position 200 times more accurately. All in all, Gaia can measure the distances of stars as far away as the galactic center — roughly 32,500 light-years away — with an accuracy within 10 percent. NASA's exoplanet-hunting Kepler spacecraft discovered planets through photometry — that is, by measuring light. It looked at regular dips in starlight caused by planets crossing between stars and Earth. Gaia can hunt worlds a different way. The gravitational pull of a planet can introduce a regular wobble in its host star's position as they orbit each other that Gaia can detect over time. Gaia will be most effective at detecting giant planets orbiting small stars. These planetary systems are prone to generating significant, noticeable wobbles in a star's position. Sozzetti and his colleagues focused on red dwarfs, also known as M dwarf stars, which are relatively small, less than 60 percent the mass of the sun. These stars make up roughly three-quarters of the stars in the galaxy, and scientists recently found red dwarfs are far more common than before thought, making up at least 80 percent of the total number of stars. Moreover, past research suggests about 6.5 percent of red dwarfs host giant Jupiter-mass planets. In addition, unlike Kepler, Gaia should be able to deduce the full orbits and masses of these giant worlds. For more than 80 percent of stars detected by Gaia around M dwarf stars within about 110 light-years of Earth, their masses could be measured to within 10 percent. Sozzetti and his colleagues detailed their findings online Nov. 11 in the journal Monthly Notices of the Royal Astronomical Society. "Gaia should be able to detect orbital motion for giant planets orbiting hundreds of M dwarfs," said astronomer David Latham at the Harvard-Smithsonian Center for Astrophysics, who did not take part in this study. The researchers also calculated they could accurately derive the masses and orbits of as many as 500 of these 2,600 planets. In addition, within this group of stars, Gaia might identify hints of 10 systems with planets that might possibly noticeably cross in front of their host stars. Astronomers have tried detecting exoplanets using astrometry before. Until now, astrometry has only helped confirm the existence of exoplanets detected through other methods, not ones astrometry spotted directly. So far astrometry has suffered about 70 years of blunders in the field of exoplanet detection, "with many a discovery announcement biting the dust," Sozzetti said. "We're finally on the verge of seeing astrometry coming of age and providing substantial contributions to this field." Sozzetti cautioned that Gaia is not sensitive enough to detect planets of about Earth's mass, as Kepler is. "Its astrometric accuracy is not sufficient, not even for the nearest stars," he said. Gaia should also not be able to detect planets within the habitable zones of red dwarfs — that is, the areas around stars where it is warm enough on a planet's surface for water to stay liquid. Since red dwarfs are very dim, their habitable zones are typically very close to them, about 3 percent to 30 percent of an astronomical unit. The astrometric signals caused by planets get increasingly smaller the closer they are to their stars, meaning that worlds in a red dwarf's habitable zone would probably be too difficult to detect. However, Sozzetti said Gaia could provide unique insights "on the existence of systems in which the likelihood of a potentially habitable terrestrial planet may have formed is high." By seeing where a giant planet is orbiting a star, Gaia can help rule out any systems where giant planets may have interfered with the formation of rocky planets within those stars' habitable zones. Sozzetti noted that Gaia and Kepler ought to be highly complementary in several ways. While Kepler can discover many small worlds, Gaia can find thousands of giant planets. "The combination of Gaia and Kepler data will allow for a much improved understanding of planetary systems' properties and frequencies as a function of the host stars' characteristics," Sozzetti said. Follow us @Spacedotcom, Facebook and Google+. Article on SPACE.com.